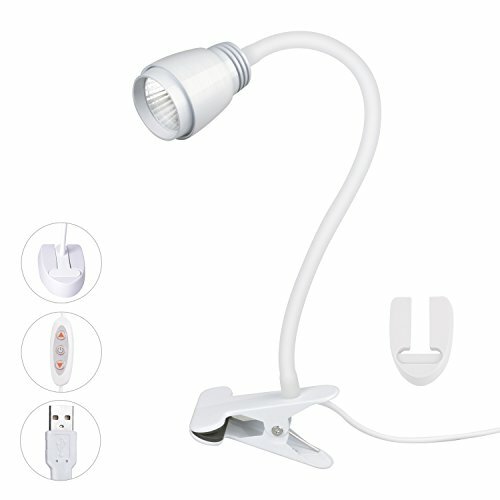 Powerful USB Clamp Lamp: Install it on headboard, office tables, bedframe, computer desk, dorm room furniture & accessories, perfect for studying, cooking, working & reading. Eye-Care Reading Light: This lamp is made of only one Lamp beads, which produces soft Eye-Care Lightning Source, Natural and Non-flickering light to relieve eye fatigue. 360-degree Flexible Gooseneck Light Design: Adjustable and durable gooseneck allow you to rotate any angle you want and keep it there. You can take it to everywhere due to high-quality silicone flexible arms make it easy to fold up in order to store compactly in your bag, handbag, or traveling bag. 2.1m USB Cable Clamp Light- Great to used as a clip Desk light with lamp holder when plugged into your PC, power bank. The switch on the wire offer convenience to adjust the brightness of the light,10 level dimmable brightness options enables you to easily create the most comfortable and perfect lighting mood. Super Long Life LED( 50,000 Hours) Clip on Light : Book Lamp brings a soft and extremely stable flickerless LED light which is kindly to your eyes. Led life more than 50,000 hours, no need to change the LED. If you have any questions about this product by Gshine, contact us by completing and submitting the form below. If you are looking for a specif part number, please include it with your message.